This dish has a really crispy topping that goes perfectly with all the gooeyness of the chocolate and marshmallows. But you can omit the crumb topping if you would like to do it. Maybe top it with even more marshmallows on top! This is so true! This is the perfect recipe to bring to a potluck as well! It is easy to put together and holds up well over time. Prepare chocolate pudding with milk on stove top as directed on package. Allow to cool in pot for 15 minutes. Spread pudding evenly into the bottom of a 9 x 13 baking dish. Lay graham crackers evenly in pudding and sprinkle with 1/2 cup chocolate chips. Sprinkle dry cake mix over pudding and dot with slices of butter. Bake at 350 degrees for 25 minutes. Remove from oven and stir making sure any dry cake mix spots have be moistened. Sprinkle evenly with marshmallows and remaining chocolate chips. 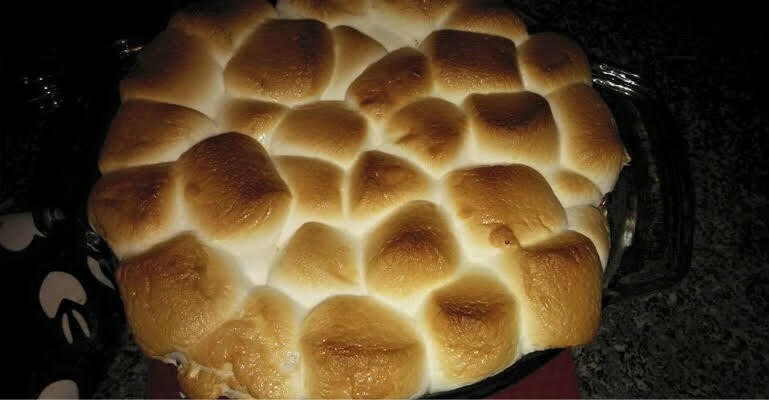 Bake an additional 5 – 8 minutes or until marshmallows are puffy and brown. Allow cobbler to cool 15 minutes before serving. Quick Tip: Use Ghirardelli chocolate chips for best results. Thanks again to Mostly Homemade Mom for this amazing recipe. This Will Be Gone Faster Than You Can Say “Apple Fritter”!